In Utopia or Bust: A Guide to the Present Crisis Benjamin Kunkel is seeking to provide readers with a concise overview of important progressive intellectuals and their work. Krunkel describes and thinks through the work of; David Harvey, Fredric Jameson, Robert Brenner, David Graeber, Slavoj Zizek and Boris Groys. I am very well read Slavoj Zizek, and moderately read in Fredric Jameson and David Harvey. The rest of the cast of characters are new names for me. The introduction stood out as the strongest element of the book. In it, Kunkel describes developing his political persona and reading through the works of the authors mentioned in this book and more traditional Marxist studies. What I appreciate is Kunkel's story of personal and intellectual growth. There isn't enough written about the impact of reading political theory on the reader. As David Harvey says in his lectures on Capital that there is something about the experience of reading Capital where the reader feels like they need to write a book about the experience. 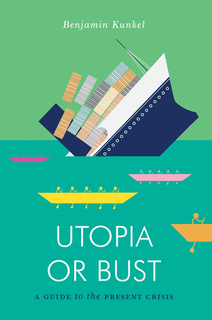 Utopia or Bust feels like Kunkel's book about his experiences reading Marx and others. As I was reading through the Utopia or Bust I was not clear on who the intended audience was. The text does a moderate job in breaking down the major points from each author in relation to the contemporary Marxist theme of the text. What is missing is a sense of interrelation or mutual exclusivity between the authors in the text, and after the introduction Kennels narrative voice only appears a couple times to inform the author of the position he takes in relation to a current topic. Why these authors and not others? I think if Kunkel continued to keep the personal tone he had with the introduction it would have made for a more fleshed out read. I would recommend Utopia or Bust to those who have a light to moderate grip on over half of the authors covered in the text. I think if you have a better solid understanding of over half of the authors you will not benefit from reading this text. If you have a light understand of half of the authors Kunkel does a good job of putting the authors into historical context and clearly explaining their major contributions to political economy.